The Spring Pollen Season is Upon Us! Spring has been slow to come to the Shenandoah Valley this year. It has been cold and windy for days; not feeling very spring-like despite what the calendar says. Regardless of the chilly temps, I have observed the steady progression of the season in the trees surrounding our house. 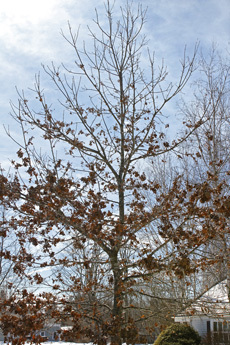 A few weeks ago, I noticed that the oaks had finally shed the last of their marcescent leaves as the buds began to swell. Soon after, the male oak flowers started to appear. Oak trees produce separate male and female flowers on the same tree. 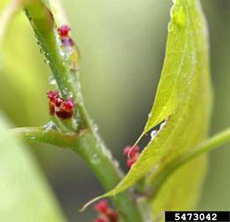 The male flowers develop first just as the tiny leaves begin to form. These conspicuous flowers are long, yellow catkins that dangle down from the tips of the branches. a central stem make up the catkin. Pollen from these flowers blows through air to pollinate female flowers on nearby trees. 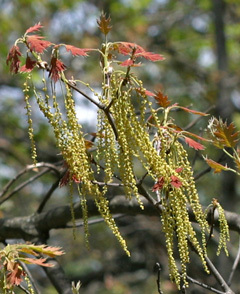 Oak pollen is produced in copious amounts and can cause real problems for those that are allergic to tree pollen. Since the catkins shed their pollen before the leaves are fully expanded, the pollen is able to drift relatively unimpeded through the air to reach the female flowers. The female oak flowers are much less obvious and in fact are seldom seen because they are very small and generally found on the tips of branches higher up in the tree. If pollinated, the female flowers will give rise to acorns – eventually. Oaks are broadly divided into two main groups; the red oak (or black oak) group and the white oak group. In general, trees in the red oak group have pointed lobed leaves and trees in the white oak group have rounded lobed leaves. Acorn development is different between these two groups. Acorns in the white oak group are sweet and palatable and mature in one season. It takes two years for acorns in the red oak group to mature; so in the fall, you may notice tiny one-year old acorns as well as the larger two-year old acorns on the same tree. Red oak acorns are very bitter tasting. Red oaks as a group generally flower earlier that the white oak group. Our mature red oaks have thousands of catkins hanging off the branches right now while the white oaks, which include the chestnut oaks, are just beginning to bud out. Acorn production can be affected by certain weather conditions that disrupt flowering or hinder pollination. Oaks rely on wind rather than insects for pollination. If the weather is misty and rainy during the time that the oak pollen is being shed, the pollen can be washed right out of the air. This can limit pollination and reduce the acorn production for that year. Freezing temperatures in the spring can kill the flowers and also reduce the acorn crop. In a good year (for the oaks, that is), the yellow oak pollen billows from the trees on the slightest of breezes. Some of it will reach female flowers on adjacent oaks but it seems that most of it just settles to the ground. So far, not much pollen has been released; it can be up to two weeks after the male flowers first appear before pollen is shed. I know the pollen clouds are coming and once they do, everything outside will be covered with a fine yellow dust! Once their pollen is shed, the catkins dry up and drop from the tree. The ground under the trees becomes littered with these spent flowers. Coming up – the pine pollen! 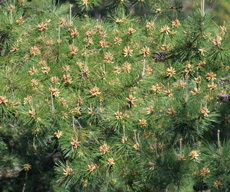 Just yesterday, I noticed that the male cones on the tips of the pine branches have begun to develop. More pollen is on the way! That was very interesting! A good way to predict next years winter’s weather? 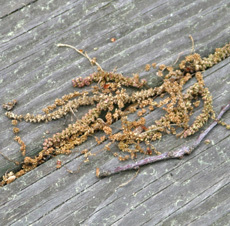 How long does the dried up Oak Catkins typically drop? Wondering if it’s safe to wash the cars or if more dropping are on the way. Thanks! Thank you for this information. We have jokingly called it tumble weed for years. They fall everywhere and roll up in balls. We weren’t sure what trees it was coming from but now we know, Good information. Thanks.